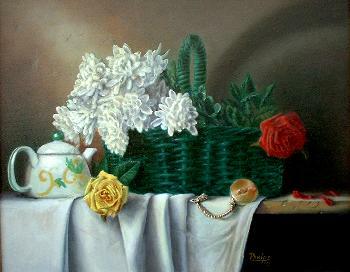 Art Composition, the best way how to compose your paintings. Art Composition the easy way. Poor Composition is usually the reason one painting seems just right, and another seems just a little off, even though the subject matter is rendered just perfectly. Art Composition = The placement of objects, lights and darks, and generally the division of space within your painting. The ancient Greeks figured this out! And they developed ways to proportion their art (from 2 dimensional paintings to architecture) for maximum pleasing effect. 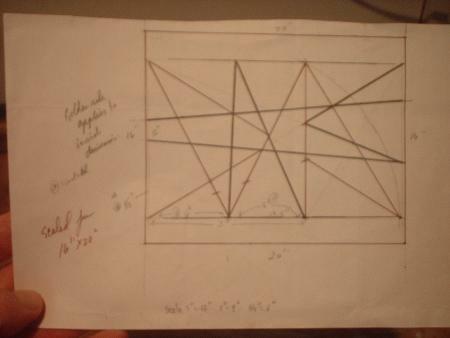 I will show you how to create this rectangle without doing the complex mathematical calculations the Greeks used. Of coarse, they developed the art composition shortcut before me. I'm just passing the info on! Using this method you will create what is known as "dynamic symmetry", an energetic, yet balanced arrangement of parts. Look at nature. Take the shell of the snail, the pattern of a leaf, the form of a tree and the flower. Within these objects you will find Balanced Symmetry. I like to start with a 3.5" or 4" square. Once you're finished you'll see that the rectangle will be 3.5" by almost 5" or 4" by 6.5". Now you understand why photographs are set to the dimensions that they are. And why most canvas's come pretty close to this arrangement also! They read my art lessons on art composition too! With this arrangement, you'll quickly be able to judge if a reference photo will meet your criterion for being a good painting! Now, back to the square. Exact dimensions aren't really important here, it just needs to be square. Then find the center line of the bottom line of your square. Point E in the photo. From point E scribe a line to point C using a straight edge. Then taking your compass, set the point on E and the writing point on C and scribe an Arc from C to F.
(Refer to photo) This now becomes the bottom right corner of your golden rectangle. Finally, finish lines (C to G) and (F to G) to close in your rectangle. This is your starting grid. 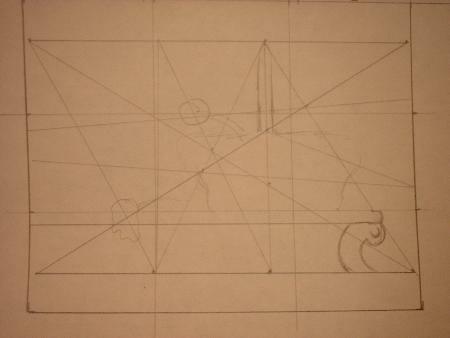 Now use your straight edge and begin drawing intersecting lines within the rectangle. These lines can really go anywhere in the grid. See examples below. You can use these examples or make your own. This is where personal taste, intuition, or whatever makes you happy comes in. There are no set rules with this art composition short cut except for one. No line should split a space directly in half! You can see in this example I have scaled the rectangle to fit within a 16" x 20" canvas. The grid is smaller than the canvas. I can fit all of my objects to match the grid at this point. 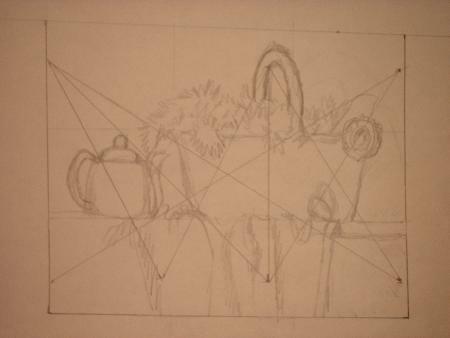 Your painting will need to have its major point of interest fall onto the intersecting lines. Your major division lines should also be major division points within your painting. Say a fold in some drape should follow one of the major division lines. 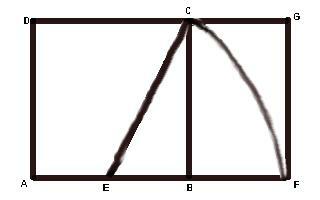 Large objects or parts that have long edges should also coincide the grids major division lines. The lemon you place on the ledge should coincide with a major intersection point. 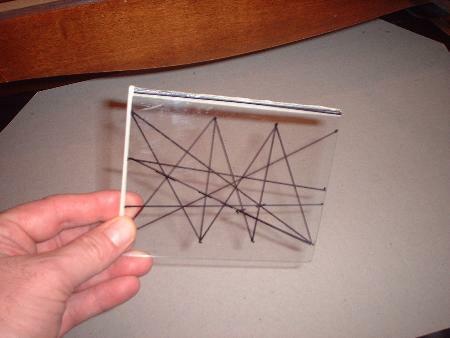 Try this idea:Buy a small piece of plexiglass, or you can even use a clear plastic sheet protector! Lay out your golden rectangle grid with its intersecting lines on it. I use a small sharpie! Then view your image through it and check for objects lining up with intersecting points, and image divisions should fall within division lines on the grid! Use this technique and never second guess your object placement again! Let the grid show you the way! Try this proof in the pudding exercise. 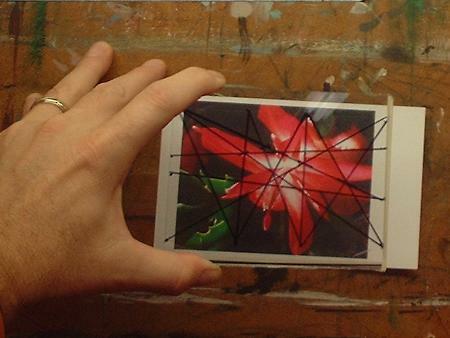 Make the grid on a postcard sized piece of plexiglass or sheet protector. Slip into your favorite local gallery or boutique that has artwork. View the art. What you'll see are major points of interest falling into the grids major intersecting points (for the piece you like) and for the dud, you'll see nothing seems to line up, or the major focal point is way off of the grids major intersecting lines. Don't just take my word for it. Try it out! Now I know what your thinking! "He made that grid to match that photo"! Trust me, I knew the piece looked good when I shot it, but I didn't realize just how good the composition was until I saw this photo of the grid against the photo! And that was this morning while typing up this page! My daughter (who's getting ready for school, it's 6:30 a.m. EST) thinks I'm crazy cause I'm doing the happy dance this early in the morning. But I had to! This is such a perfect example of this art composition shortcut theory! It was a successful piece in two ways. It fell within the parameters of the golden rectangle grid and it sold! It now hangs in a posh retirement community entrance! As you can see, I have shifted the basket to line up with a major vertical component of the art composition shortcut grid! 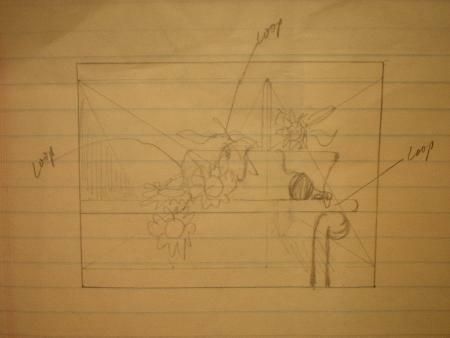 As you can see from the sketches, they are for figuring out the placement of objects only. I didn't get into high level drawing techniques, or details. Just a rough sketch of the overall look. When I was happy, I made the still life setup match my sketch, and now you know the rest of the story! That's it! You've got the ancient Greek secret on composition! Would you like to see an even more simpler template for this same idea, click the link here on composition in art! It's another page on composition using another age old technique you may find of interest. I talk about the rule of 3rd's, yea you've heard about that one, but did you know about the Fibonacci Sequence? Or a Generic Armature? They are simple to use and easy to remember! Click Me to see the expanded article on composition!